MDF skirting is one of our best selling materials, available in all our designs. Our product range is cut using superior quality carbide cutting knives for an extra smooth finish, making it even easier for you to prime and paint. You may even choose to let us prime your products, ready for you to simply paint with a top coat of your choice, saving you more time and money. Or perhaps you wish to purchase from our moisture-resistant MDF range, ideal for use anywhere in a building, as it combats damp and moisture for a greater life. 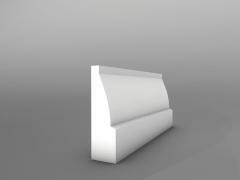 These additional options are also available with our architrave sets. Our unique MDF Ovolo skirting boards and architrave sets, can be created for you in either a 3050mm (10ft) length, or an extra long 4200mm length, which are exclusively supplied by us, again with a moisture-resistant option, however please allow 5 to 7 days for delivery if you require the extended length. An extended length, has the main advantage of less visible joins. Our MDF architrave sets are also available in two different lengths, to accommodate for the size of your door frames. We produce all our products ourselves, at our UK manufacturing base. Why not consider our Ovolo hardwood architrave sets, available in a variety of superior quality options; European Oak, Sapele, Oak, Tulip and Ash all finished to perfection. Remember perfection takes a little time, so please allow 7 to 14 days for delivery on our hardwood selection. We ensure all our hardwoods are sourced from a sustainable resource. Our hardwood Ovolo skirting boards are only available in a 3050mm length, and not the extended length, however they are all available in the variety of materials featured above, once again finished to perfection using superior cutting knives. 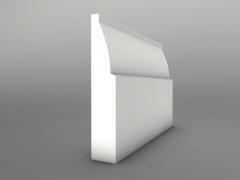 This unique Ovolo skirting design, can be supplied in a 68mm sample, for just £1.67. The sample may give you a better perspective of the design which would be displayed around your room.